This report analyzes the market for a period of six years. On the basis of systems, the industrial security systems market is categorized into video surveillance systems, access control systems, and intrusion detection systems. Each of these systems is further categorized on the basis of products. The video surveillance systems market is segmented into analog cameras, IP cameras, CCTV cameras, DVR, NVR, video encoders, and surveillance software; the access control systems market is classified into smart cards & readers, RFID tags, biometrics systems, Automatic Number Plate Recognition (ANPR) systems, vehicle tracking systems, automatic boom barriers, turnstiles, automatic swing gates, under vehicle inspection systems and electronic locks; the intrusion detection system consists of control panels, detectors, keypads, and accessories. Apart from this, in this report the industrial security systems market is sub-segmented on the basis of end users, service, components, and geography. The geography-wise analysis includes a product-level breakdown across five geographic regions which constitute North America, Europe, Asia-Pacific, Middle East, and the Rest of the World. The Rest of the world encompasses the Latin American and African regions. 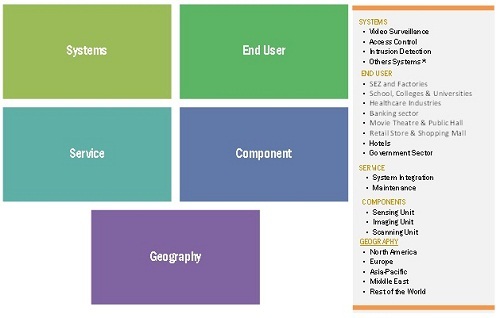 Additionally, the market is segmented into various regions on the basis of end users, service, and components. In this report, the drivers and restraints for this markets is analyzed, including their impact analysis throughout the study period. It provides the detailed global market share analysis as well as porter's five forces analysis for the industrial security systems market. The key players profiled in this report include Honeywell International, Inc. (U.S.), Bosch Group (Germany), Cisco Systems, Inc. (U.S.), L-3 Communications Holdings (U.S.), Securitas AB (Sweden), and Johnson Controls, Inc. (U.S.). This report gives a general overview of these companies along with their complete financials, key products & services, key growth strategies, major market acquisitions, new product launches, and business expansions in the recent past. This report consists of a detailed description of the industrial security systems market on the basis of systems, end users, service, components, and geography over the next six years. It discusses the industry, market, and technology trends which currently prevail in this market. On the basis of systems the market is categorized into video surveillance systems, access control systems, and intrusion detection systems. Each of these systems is further classified into sub-segments on the basis of products. The industrial security systems market is projected to be around $25 billion in 2014 and is expected to reach $38 Billion by 2020, growing at a CAGR of 8.69%. The video surveillance systems market is categorized into analog cameras, IP cameras, CCTV cameras, DVR, NVR, video encoders, and surveillance software; the access control systems market is classified into smart cards & readers, RFID tags, biometrics systems, Automatic Number Plate Recognition (ANPR) systems, vehicle tracking systems, automatic boom barriers, turnstiles, automatic swing gates, under vehicle inspection systems and electronic locks; the intrusion detection system consists of control panels, detectors, keypads, and accessories. The market is driven by the growth in demand for security systems due to an increase in the rate of insurgent activities, globally. While, the lack of awareness about highly integrated security systems among the end users pose as the major restraint for this market. The European and the Middle Eastern regions are presumed to remain as the emerging markets for industrial security systems. Honeywell International, Inc. (U.S.), Bosch Group (Germany), Cisco Systems, Inc. (U.S.), L-3 Communications Holdings (U.S.), Securitas AB (Sweden), and Johnson Controls, Inc. (U.S.) will occupy a significant market share in the industrial security systems market in coming years. 13.11 Alliance Systems Integrators, Inc.